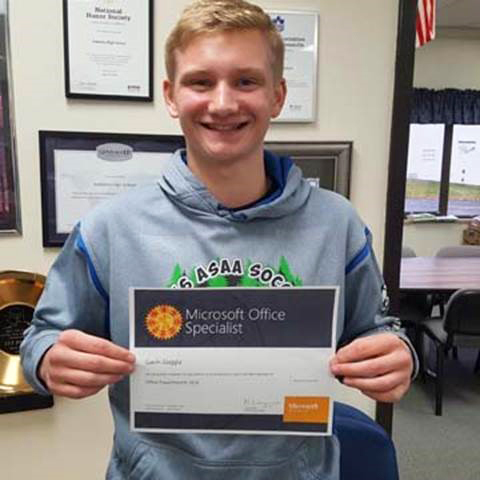 Congratulations Gavin Goggia, Soldotna High School senior, for passing the Microsoft PowerPoint Certification exam and becoming the first KPBSD student to become Microsoft Certified. Gavin is one of 144 KPBSD Online Computer Applications 1-4 students, and several more students will earn certification by the end of the semester. These students are currently training for one or more of Microsoft’s Office Specialist Certifications in Word, PowerPoint, Excel, Outlook or Access. These elective courses are taught online by Darren Jones from the KPBSD Distance Learning Program and offered to every KPBSD 9-12th grade student. The Computer Applications course content has recently been updated to now allow students the opportunity to become Microsoft certified upon completion. Students who successfully complete these courses may also earn college credit from University of Alaska Kenai Peninsula College Campus. Microsoft certifications give students the power to chart their own course, fulfill their ambitions, and realize their potential. These certifications give students the tools to build a brighter future and prepare themselves for a successful career. In addition to all KPBSD students having access to the certification trainings, all KPBSD staff and teachers can now participate in the same online trainings to earn college credit and become Microsoft Certified! This entry was posted on October 6, 2017 at 4:31 pm. You can follow any responses to this entry through the RSS 2.0 feed. You can leave a response, or trackback from your own site.